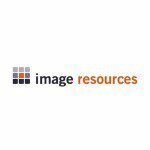 The future has a glow to it for Image Resources (ASX:IMA). 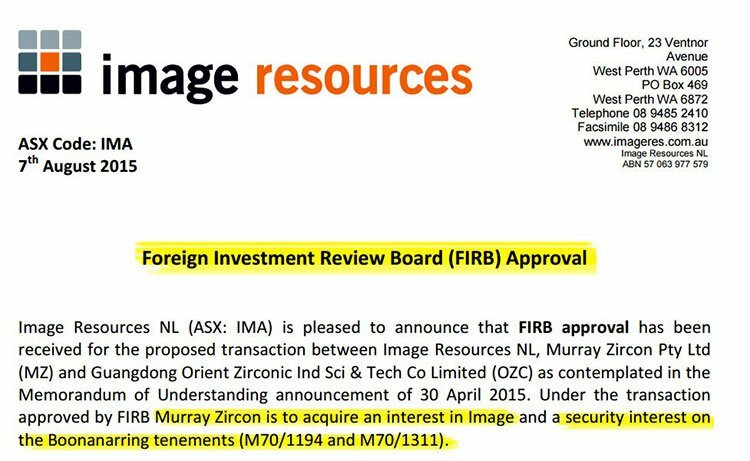 In the article we went into detail about IMA’s potential, both in terms of exploration and resource quality but also, as part of a possible takeover/merger given its close proximity to mineral sands giants Iluka (capped at $3BN) and Tronox (capped at $600M). Aussie-based Iluka and US-based Tronox are the two most dominant producers of the hottest mineral sand out there: Zircon. So dominant, that these two juggernauts have sewn up over 70% of the entire market between them. Does this sound familiar? It sounds to us a bit like how Fortescue broke up the BHP and RIO dominance in iron ore.
Little IMA has flown in like a bat out of hell to sandwich itself between Iluka and Tronox, established high grade prospects and most crucially of all, has signed a provisional offtake agreement with OZC as part of the MoU. New zones have been identified surrounding IMA’s zircon enriched Bonanarring deposit – where a 5km northern extension and a 6.3km southern extension are currently being drilled out to add significant mine life. IMA’s drilling strike rate to date is exceptional – 50% of the drilling so far within the North Perth Basin has been within mineral sand resources. IMA is not without risk – it’s a small, emerging company, and a speculative stock. 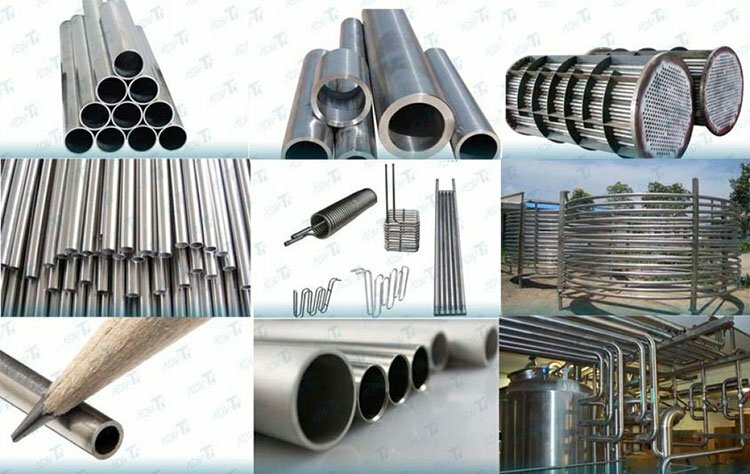 The company has just raised $1.88M via a share placement from sophisticated and institutional investors, is closing in on finalising outstanding paperwork to begin production, and has a MoU in place to fast track the sale of its resources. Included in Image Resources (ASX:IMA)’s MoU, whereby the company will receive over $40M in commercial benefits is US$8M in downstream working capital, key expertise and use of a production processing plant, with an option to buy. All the details can be read here . The offtake agreement IMA is lining up is likely to allow the smooth sale of at least 90% of all the zircon it produces – giving shareholders a degree of certainty regarding future cash flow. The zircon market is growing steadily on the back of heightened demand for new nuclear power stations in China, and the re-emergence of nuclear power in Japan following a four year hiatus induced by the Fukushima Daiichi disaster in 2011. Nuclear power may be a controversial topic for conservationists, but some entrepreneurs are betting on it to be a likely money-spinner, fuelled by China’s expected growth in nuclear power generation over the next 10 years. 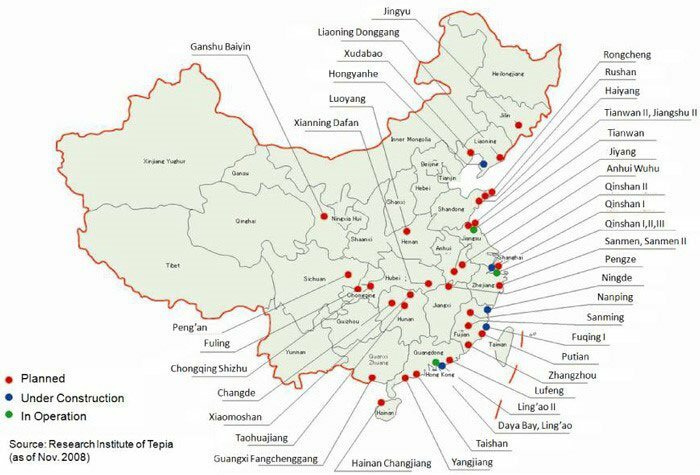 Here’s a reminder of where China is going to be building its 30 nuclear power stations, with a view of bringing about a boost in annual power generation from 20GW today to 58GW in 2020. One company that dominates the Asian zircon market in particular is China’s tongue-twistingly named Guangdong Orient Zirconic Ind Sci & Tech Co (OZC). The company is an industry juggernaut employing over 2,000 people and listed on the Shenzhen Stock Exchange (SSE), currently capped at $1BN. OZC owns 65% of MZ as part of its vertically integrated strategy to source and supply zircon globally via an integrated network of companies and offtake agreements – and this is where IMA fit into the puzzle via its proposed transaction with MZ. IMA will receive an option to purchase MZ’s dry mineral separation plant. The deal with IMA is crucial because it splits the dominant oligopoly held by the two largest mineral sands producers in the world – $3BN-capped Iluka (ASX:ILU) and $600M-capped Tronox (NYSE:TROX). These two powerhouses deliver 70% of the globe’s mineral sands production, and have therefore had a pretty easy run without significant competition. 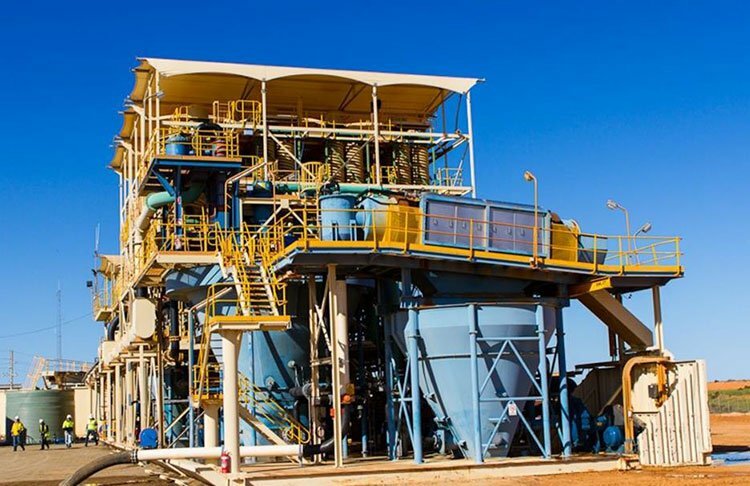 With OZC & MZ in tow, IMA is aiming to gate-crash this party by producing around 7% of the world’s zircon demand from its Boonanarring project in Western Australia. From all the zircon it produces, 90% will be offloaded to OZC as part of the MoU agreement. Zircon currently sells for US$1,100/tonne, while IMA’s estimated production cost is around $300-400/tonne. IMA’s current reserves stand at 24.1Mt with 8.2% Heavy Minerals, including one of the highest grade undeveloped mineral sands deposits in the world boasting zircon grades as high as 24.5%. IMA is aiming to produce around 40,000-60,000 tonnes per year from a 3-4Mt operation. That equates to approximately $72M in annual revenue (assuming a sale price of US$1,200/tonne and a production rate of 60,000tpa). However there are a lot of hoops to jump through before IMA gets into production, and it may never hit these kinds of revenue targets – it remains a speculative stock for now. IMA has been working hard to finalise all of its exploration work and commercial agreements – with a view of going into production next year. Its BFS is just months away from completion and attractive production margins are already on the horizon. IMA is not resting on its laurels though. With one of the highest grade undeveloped mineral sands deposits in the world, IMA is already drilling to expand its resources further to be included in its BFS. Mapped out below, you can see IMA’s two major projects: ‘Atlas’ and the flagship ‘Boonanarring’. Notice that both projects are in close proximity to Tronox’s operations in Cooljarloo and processing plant near Gingin in the south. Atlas holds probable reserves of 9.7Mt @ 8.1% HM while Boonanarring holds 14.4Mt @ 8.3% HM (Heavy Minerals). Combined, IMA has access to over 24Mt of Ore with grades of 8%-10% HM. IMA’s location has so far provided excellent traction amongst offtake partners, investors and shareholders. In the meantime, it’s proving very troublesome for Tronox who now have a significant competitor right on their doorstep. Could a takeover be on the cards? Although it’s still very premature to expect a takeover, it’s always a possibility here. Or perhaps an offtake agreement could be more likely, as it would help Tronox avoid IMA’s produce hitting the market and lowering prices. IMA’s flagship asset, Boonanarring had a Feasibility Study completed in 2013 for a prospective mine life of 7 years. However, given the quality of the resource and ample backing from project partners, IMA has commissioned a feasibility study update that will almost certainly allow IMA to expand its JORC resource size and mine life from 7 years to 10 years. IMA is actively exploring several tenements and best of all, this explorer is making good headway with a new drill programme launched last month. IMA’s 7 year mine life expected to be extended soon on the back of results as they come in and added to the BFS. Given Tronox and Iluka’s overwhelming market dominance, the two giants may consider a takeover offer simply to maintain their existing market position. The question is when will they make these considerations and when will one of them make its move? 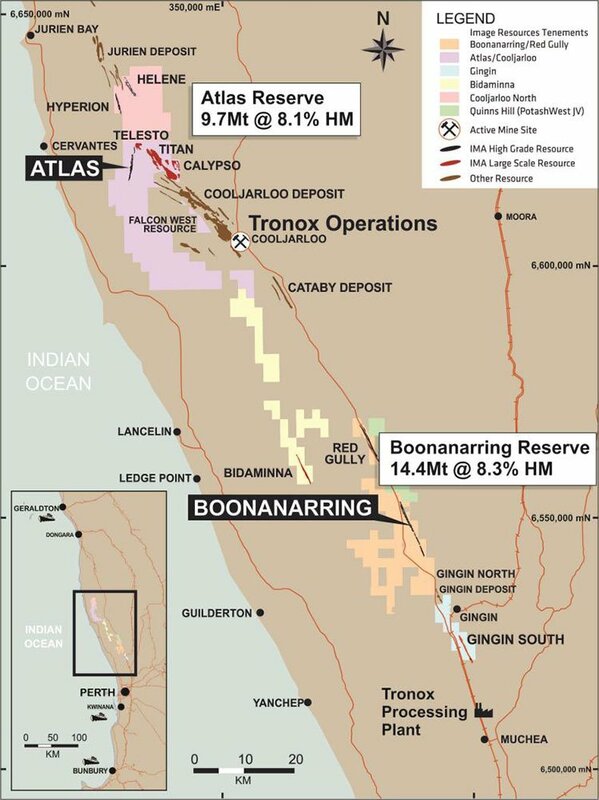 The operational proximity to Tronox and Iluka has opened up significant collaborative possibilities for IMA which is probably why it’s so keen to get Boonanarring into production as soon as possible. There are no guarantees of success in the world of small cap minerals explorers – and IMA is no different – investors should proceed with caution. Here at The Next Mining Boom , we’ll be a keeping close tabs on this glowing mineral sands explorer, wedged between giants. Upstart ASX Explorer Sandwiched Between Billion Dollar Giants: Takeover on the Menu?